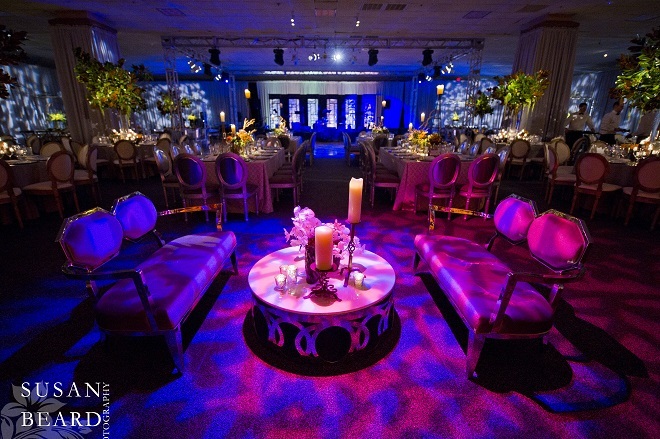 That’s what we want to create for our clients no matter what type of event we’re designing for you. This moment of speechlessness and joy, captured so beautifully by David & Blonnie photo + cinema, says it all and speaks to our hearts as creative professionals. The Sneak, the Peek, or the Ballroom Reveal. No matter how you label it, it’s just a few minutes of privacy in an otherwise jammed wedding day. Wrangling our brides and grooms out of their cocktail reception and away from their guests is never easy, but as you can see, those few stolen moments are worth it! Seeing the ballroom in all its romantic glory is appreciated by all. Particularly after we’ve talked and dreamed about the flowers (and linens, and candles, and dance floor, and lighting, and chairs) for months! MAGIC MOMENTS FOR WEDDING PLANNERS. But aside from the stunned amazement enjoyed by our clients, what a gorgeous moment for us at Evantine Design! As Janey and Andrew’s wedding planners, event designers and overall partners in crime, there is nothing more heartwarming than to share these moments with them. In addition to feeling that whoosh! of relief that the design is loved, we got just as blurry-eyed and mushy-brained as they did! We thank Janey and Andrew, as well as their families, for including us in yet another family celebration. 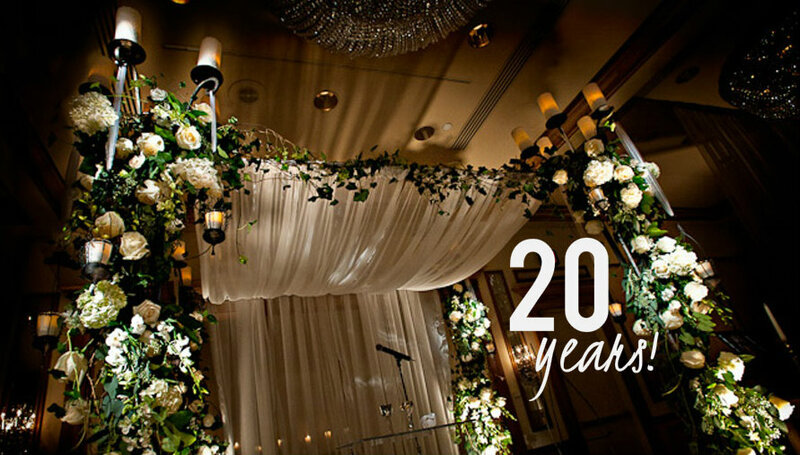 ABOUT US: Celebrating 20 Years at The Rittenhouse Hotel! WE’RE CELEBRATING 20 YEARS AT THE RITTENHOUSE! Unbelievably, this week marks the 20th anniversary of the opening of our Evantine Boutique at The Rittenhouse!!!!! Although we were creating some of Philadelphia’s chicest parties for years (and years, and years…) before we moved into this prestigious hotel, it seems like just yesterday we signed the lease for the lobby retail space. From designing stylish parties and lavish weddings in their elegant ballroom, to wrapping up fresh floral bouquets daily for dedicated clients, landscaping the garden with seasonal blooms, and decorating the lobby for the holidays, over the past 20 years we have gotten to know the hotel inside and out as our second home! Truly, it has been an inspiring 20 year partnership! Over the years we have had the pleasure to work with many talented members of The Rittenhouse staff. Most particularly, Lori Maslowski in the catering department. Right up to last night when we were back in the ballroom with a cool Mad Men-themed party! As usual, Lori and her talented food and beverage team made sure each and every detail was taken care of beautifully and efficiently. Thank you Team Rittenhouse for all that you have done and continue to do! Everyone at Team Evantine looks forward to another 20 years! Modern garden setting inspired by a chic hotel. Evantine Design. This bar mitzvah at the Valley Forge Casino and Convention Center challenged us as we had a very limited time frame to load in and install an intricately designed event in a cavernous space underground. Yes, challenging. If only for the WIFI hiccups. But with exceptional advanced planning (the Secret Service has nothing on Team Evantine! ), as well as the right production team working together with each event professional as tightly as the Philadelphia Orchestra, only beautiful results are possible! Miles of drape, piles of carpet, crates of truss, boxes of fixtures, load after load of furniture, accessories, flowers, glassware, party favors, and who knows what else, James’ Bar Mitzvah was a real eye-popping stunner! Over the years, Evantine Design has had the pleasure and honor of designing the event decor for many of the prestigious Marian Anderson Awards Galas. 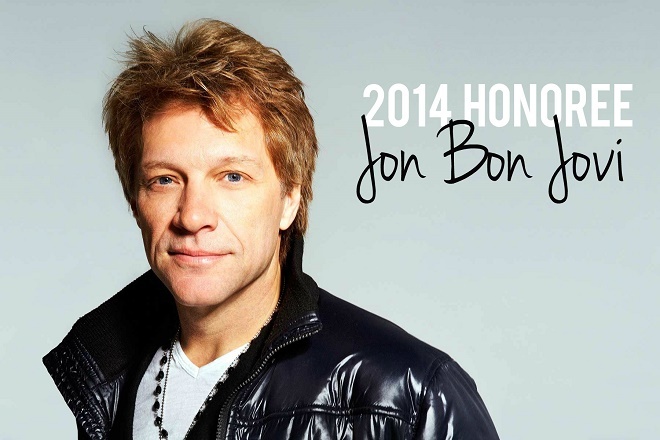 Tonight’s grand celebration honoring American singer-songwriter, record producer, philanthropist, and actor JON BON JOVI, is sure to be as incredible as the others. If not more so. Not only for the amazing show that will assuredly take place on stage in the magnificent Kimmel Center for the Performing Arts. But also, and more importantly, for the well-deserved recognition the event will highlight of the work Bon Jovi has done, and continues to do, to fight hunger and homelessness through Project HOME and the Jon Bon Jovi Soul Foundation. Many of his philanthropic projects focus right here, in and around Philadelphia, which makes this year’s dedication even more precious as our local community has been touched so personally by this humble humanitarian’s passion for helping others. We particularly admire his community restaurant JBJ Soul Kitchen in Red Bank, New Jersey as HOPE really is delicious. Tonight’s 2014 Annual Award Gala Dinner and Concert program guarantees a rockin’ night to remember with comedienne Wanda Sykes as host, spoken tributes by Senator Cory Booker and Project HOME Executive Director Sister Mary Scullion, as well as performances by Grammy Award-winning Estelle, The All American Rejects, Jon Batiste and Stay Human. Reaching out to others less fortunate really is a simple and straight-forward concept. One we have always taken to heart here at Evantine Design as that’s the principle Creative Director, Brian Kappra, feels strongly about himself and strives to honor every day. In other words, giving back isn’t complicated. It is black and white with sunshine rippling through it in hopeful, caring ways. Reflecting on that clarity of purpose, in our own simple way, for tonight’s gala, Evantine Design will be creating a comfortable black and white environment with pops of bright happy yellow, magenta and purple. It is a true honor to participate once again in this amazing annual event. We encourage you to read more about the esteemed Marian Anderson Award below as it really is a tremendous gift to the City of Brotherly Love, as well as the greater community around us. The Marian Anderson Award, sponsored by Wells Fargo, honors artists whose leadership on behalf of a humanitarian cause(s) or issue(s) benefits society. Previous recipients include Berry Gordy (2013), James Earl Jones (2012), Mia Farrow (2011), Bill Cosby (2010), Maya Angelou and Norman Lear (2008), Richard Gere (2007), Sidney Poitier (2006), Ruby Dee and Ossie Davis (2005), Oprah Winfrey (2003), Danny Glover (2002), Quincy Jones (2001), Elizabeth Taylor (2000), Gregory Peck (1999), and Harry Belafonte (1998). No award was given in 2004 or 2009. Created in 1998, the Award is named for the great Philadelphian and American singer Marian Anderson, and is produced and administered under the direction of J. Patrick Moran. Since its inception, the Award program has provided more than $500,000 in free public programs, residencies, commissions, and grants to young artists. Marian Anderson, the most celebrated contralto of the 20th century, was born in Philadelphia on February 27, 1897, to an African-American family of modest means. Recognized for her extraordinary musical talent, as well as her generosity and commitment to others, Ms. Anderson was a master of repertoire across operatic, recital, and American traditional genres. Throughout her musical career, she played an incalculably vital role in the acceptance of African-American musicians in classical musical and in other previously segregated performing arts genre. In 1957, Ms. Anderson was appointed by the U.S. Department of State to serve as a Special Envoy to the Far East, and the following year President Dwight D. Eisenhower named her to the post of delegate to the General Assembly of the United Nations. She sang at President John F. Kennedy’s inauguration in 1961; in 1963 President Lyndon B. Johnson bestowed the Presidential Medal of Freedom upon her. On her 75th birthday, in 1974, the U.S. Congress passed a resolution ordering a special gold medal minted in her honor. On April 8, 1993, Marian Anderson died at the age of 96 in Portland, Oregon. Her legacy continues to shine. Welcome to our new Thursday “Thank you” blog series where we intend to start sharing some of the truly unbelievable thank you notes and testimonials we are lucky enough to receive from our clients. As you can imagine, “Thank You” can be an incredibly powerful pair of words and we never tire of hearing them. After spending months or years producing an event there is nothing better than hearing feedback from our client on how they experienced the event. We want to know if we nailed it! Did we achieve the intended goal? Were they blown away by all the details? What did they hear the most from their guests? Did we create magic, if only for one day? We live on this stuff, seriously! So, here we are, ready to share our first amazing thank you note from one of our recent Bat Mitzvah clients who hosted their daughter’s special event at the Four Seasons Hotel Philadelphia earlier this summer. Thank you so much for all of your magnificent recommendations, designs, planning, organizing and execution of Rachel’s Bat Mitzvah! It was truly beyond what I could have ever imagined. There was not a detail left undone. It was just PERFECT! Brian is truly a creative genius. The graphic arts designs were unbelievable! 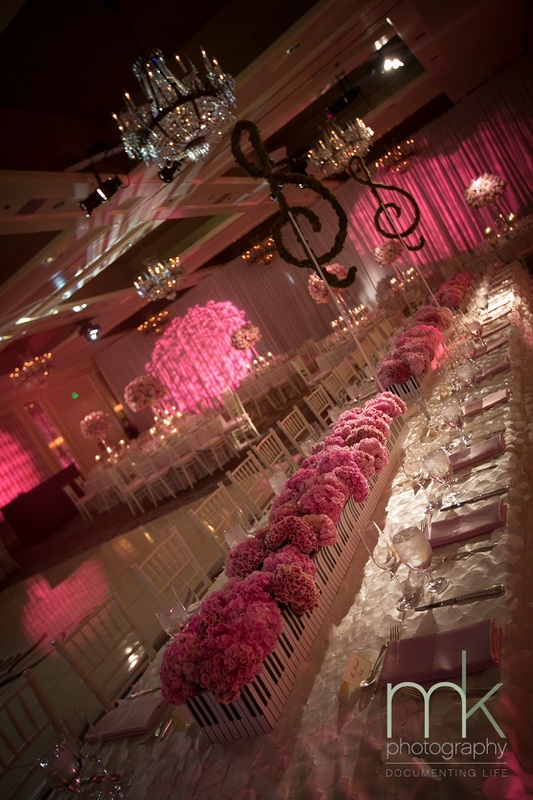 The flowers, tables, linens, gift boxes and of course custom dance floor were incredible! I truly feel honored to have had the privilege of working with all of you and seeing what artistic talent truly is.Thank you for making Rachel’s day the most special and a memory we will never forget. Motown founder Berry Gordy, Boys II Men, Chris Tucker, Kenny Gamble, Leon Huff, Brandon Victor Dixon and Smokey Robinson! Just another Tuesday at Evantine Design, Inc. as the crew heads to The Kimmel Center for the Performing Arts to install fabulous décor for tonight’s Marian Anderson Awards Gala honoring the incredible music industry icon, Berry Gordy. 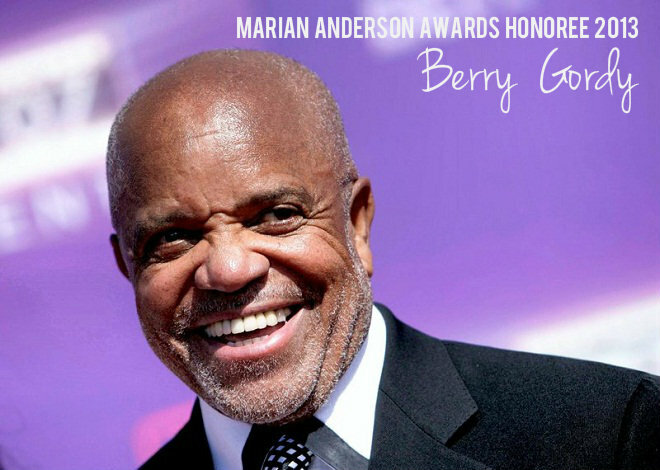 As it always does, the gala brings out the creme de la creme of Philadelphia society with just over 600 guests attending to honor and celebrate the amazing career of Berry Gordy. After all these years, we still manage to get starstruck when confronted with such amazing talent. Hosting the 2013 Award Gala will be critically-acclaimed actor and comedian Chris Tucker, seen most recently in the Academy Award-nominated film “Silver Linings Playbook,” set in Philadelphia. To honor the musical legacy of Motown founder Berry Gordy, the performance line-up will feature stars of American pop music. The program will include two multiple Grammy-winning groups: Philadelphia’s own Boyz II Men plus Kool and the Gang. Joining them will be Philadelphia up-and-comer, Cody Wise, who starred in the “Lion King” on Broadway. Motown superstar Smokey Robinson will present a tribute, along with “Philly Sound” songwriting and producing pioneers Kenny Gamble and Leon Huff, followed by a special performance by Tony Award nominee Brandon Victor Dixon, who stars as Gordy himself in “Motown The Musical.” Finally, to mark the 15th anniversary of the Marian Anderson Award, Former Governor Ed Rendell will be honored as its founder and for his impact on the arts in Philadelphia. Anderson, and is produced and administered under the direction of J. Patrick Moran. Since its inception, the Award program has provided more than $500,000 in free public programs, residencies, commissions, and grants to young artists. Envoy to the Far East, and the following year President Dwight D. Eisenhower named her to the post of delegate to the General Assembly of the United Nations. She sang at President John F. Kennedy’s inauguration in 1961; in 1963 President Lyndon B. Johnson bestowed the Presidential Medal of Freedom upon her. On her 75th birthday, in 1974, the U.S. Congress passed a resolution ordering a special gold medal minted in her honor. On April 8, 1993, Marian Anderson died at the age of 96 in Portland, Oregon. Her legacy continues to shine.